Medina, Misamis Oriental is no Boracay island, but it has a white beach that cures my Vitamin sea deficiency. This beach is in Duca, where Philippine beach resorts like Duka Bay Resort, DU Dy, and Capistrano Beach are known mostly only to locals. Duca beach (a.k.a. Duca White Beach) is one of the best beaches in the Philippines, and yet some of you have probably never been there. I am most familiar with the route via Cagayan de Oro City, which is 2-3 hours away by bus. Choose the "Portulin" Medina bus stop near Duka Bay resort. This is the quickest way to go to the beach area. Most bus conductors know this bus stop, too. But, if you happen to accidentally find yourself at the other bus stop, Fiesta Brand in Cabug, do not panic. Take the next tip below. When in Medina, travel by "motorsikad". Recommended way to travel around Medina is by motorsikad, Medina's main means of public transportation. It not the same as Cagayan de Oro's motorela. The seating arrangement is also different, but it is just as interesting in structure. Motorsikad fare per passenger varies from 7 to 10 Php pesos (0.20-0.25 USD), so get your change ready. 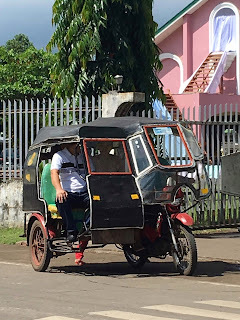 If you happened to ride a "sikad", a bike with sidecar or motorsikad without a motor, the fare varies on your conscience. Ha ha! But seriously, it varies from 5 to 10 pesos per passenger. It is best to ask the engine (a.k.a the driver with human power) before going on the ride. There are no taxis and jeepneys around Medina. Motorsikads, and sikads rarely operate after 9PM. So enjoy the silence and the fresh air. Duca white beach is on my list for the best beaches in the Philippines. The local beach resorts here with at least basic amenities are Duka Bay resort, Capistrano resort, and D.U. Dy resort. It is no Boracay beach, so do not expect commercial food chains 10 meters from the shore of this beautiful Philippine beach. Medina's Alibuag Cold Spring, is a wonderfully unique swimming attraction as well. A cemented rock pool surrounding a natural freshwater cold spring. The water is clear and very cold. You might want to see it to believe it. Then, a special event that is worth mentioning is “Hinuklog.” It is a Medina re-enactment street play based on "Pasyon Ni Kristo" (translation Passion of Christ). It happens during the Holy days of the Holy Week. It is a yearly tradition in Medina, Misamis Oriental that continues to gain popularity among Christian and non-Christian tourists. So what do you think? Do you want to know more about other Philippine beaches? Do you want to know about where to stay in Medina Misamis Oriental? For your questions, just mention them in the comment section below. If I had convinced you to visit Medina, don't hesitate to tag me #munchtrip in your posts so I can see them. Catch you later! See you on my next munchtrip. So cool. I just love going to the beach and reading. I'll be at the beach this summer and I can't wait. If you don;t mind sharing, which beach are you going to? This sounds amazing I would really love to visit one day. Oh please do! You won't regret it. Currently cooking up the article for the cheap places to stay in Medina Misamis Oriental. Cherry on top: accommodations are from $10 to $45 per person. we are always drawn towards the water. These are great travel tips! A secret beach sounds so intriguing. If I ever make it to the Phillipines, I would definitely seek you out to learn more. While reading about the Medina beaches, I kept wondering when I can unveil the beauty to my heart. Thanks for sharing about this beauty spot of nature in the Phillipines. Doctor Love is needed in the building. Paging Dr Love? ha ha. Anyhow, you're welcome. This sounds like such a magical amazing place! Always love a beach view! Would love to know where you stayed! Amazing! More pics of the beach please! Love the motorsikad - never heard of one of these before! What an amazing trip and beautiful beaches...and hide away. I grew near the beach and love to escape to it. The sidecar sounds like a fun way to get around as well. Oh wow my dad would absolutely love these beaches! He's a beach lover through and through and he's heard of the incredible beaches in the Philippines. I love the sound of the ocean, I've always loved it. The sound is so relaxing, I'd love to visit this beach. Thanks for sharing. This sounds like such an amazing place! I'd love to visit this beach. Thanks for sharing. I always want to a travel to beach and enjoy the peace. I love watching the sunrise or sunset, so relaxing. Wow this all looks amazing to me! I am going to have to book my trip soon and try to visit them! What a peaceful and relaxing way to spend a vacation! I would love to go. I love to visit beaches this summer. and yes, In the Philippines lots of breathtaking and stunning beaches to visit. I really miss my hometown. Would love to go there someday. I love going to the beach. These are great recommendations. Thanks for sharing.